I am currently working on an Heirloom Baby Set by designer Nell Abshire, the Afghan Queens. In the pattern she suggests Estillo yarn which is a thin dress yarn. She tells how to do the modified e wrap cast on using two threads of yarn for the cast on. I am sure I have seen this before but thought I would share it with others that might not have seen it. This can be done on any machine. I like the finished edge and it gives body to the jacket edge. 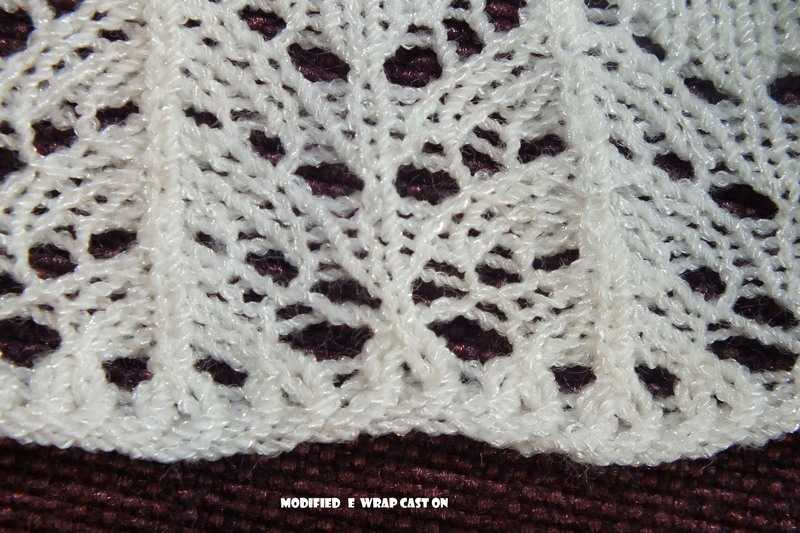 I think this would be a great cast on for the beginning of a lace scarf or any scarf for that matter that uses a thin yarn. It makes the edge stronger for tassles too if you use them on a scarf. If you use this on a scarf and want both ends the same, start the scarf and knit to the middle and take off on waste yarn. Then knit the second half and do the same. Then Kitchener stitch the pieces together. Here are the directions and pictures if you would like to try it. Hi, I have done two yarns before for that same firm edge…but not like that. Simply used two strands and e wrapped as one. Not using the ravel cord. Good thing you added the verbage because I would have missed that the blue “yarn” was the ravel cord. And that looks like you e wrapped that as well???? So how did that pull out at the end? Oh and I never used the method of going behind two needles…it is always interesting how someone thinks of these things 🙂 I must go try and compare the difference ! Hope all is well and thanks for sharing ! Hi Friend, You will knit with waste yarn and then knit one row of ravel. The blue is the ravel cord. The main yarn is getting wrapped. Wish I could take credit for thinking of doing this technique! Thank you again for sharing so much information.